This pictoresque Óbidos village is located in Portugal’s Silver Coast. These lands with a rich past and history were considered one of Portugals’ seven wonders. If you are willing to explore and enjoy your stay in Óbidos, you will have to plan your visit. Inside the village, you can divide your tour by the Religious Heritage, Art Museums and Galleries, or the Castle and its Walls. Outside of the village going towards Caldas da Rainha you can find a sanctuary – Senhor Jesus da Pedra and the archaeological station – Eburobrittium – a roman city that has been in these grounds for centuries. 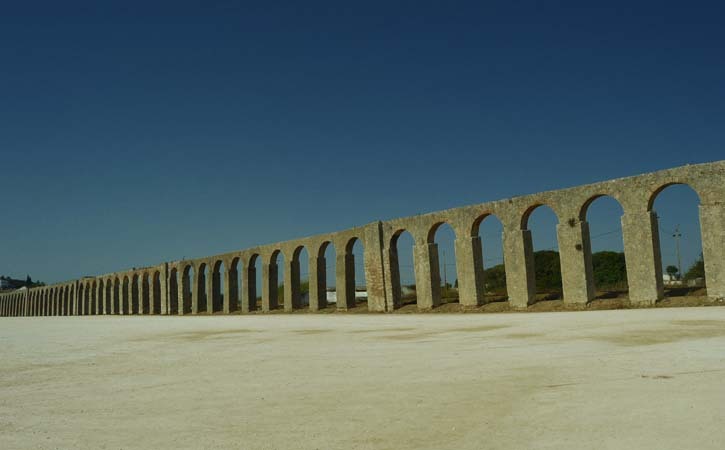 On the opposite direction, towards Peniche you will find a water aqueduct that used to link Óbidos to Usseira. After consuming these pieces of history that made Óbidos what it is nowadays, you can change the course and get to know one of the biggest lagoon system in Portugal – the Óbidos Lagoon. Arriving at Óbidos lagoon you will find yourself with a lot of quality time spending and leisure options. There are many paths ideal for walking, relaxing and watch the fauna and flora near the lagoon. You can also get to one observatory and watch birds like flamingos. If you get tired, why not pause your tour for a while and do a picnic. Places like Covão dos Musaranhos are equipped with public grills where you can cook your lunch! But wait! There is much more to this lagoon. After the walks why don’t you try some extreme sports like Kitesurf, Windsurf, Paddleboard or Canoeing? However, if you are looking for a softer sport, you can always try some Golf in one of the many courts surrounding Óbidos village.